Arcam announces Solo Bar Plus with performance upgrades | What Hi-Fi? Arcam's Solo Bar Plus may look similar to its predecessor, the Solo bar, and it features the same six high-quality drivers with 100 watts of “Real-Power” amplification under its hood. But thanks to some software tweaks, Arcam says these will now deliver extra “slam and impact” to the Movie Mode and give more “life and air” to music. The Solo Bar Plus has an Arcam AV receiver at its core, which is capable of decoding Dolby True-HD and DTS-HD and has 4 into 1 4K HDMI switching. 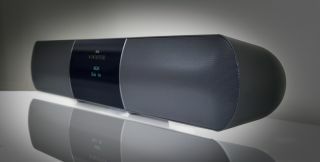 Connections include coaxial and optical digital inputs, 3.5mm input and aptX Bluetooth for wireless streaming. The Solo Bar Plus can also output via Bluetooth for wireless private listening through a pair of headphones, and it also comes with an integrated auto setup function and EQ, the settings for which have been updated and revised. Owners of the current Solo Bar can upgrade to the new Plus features via a free firmware update, while new customers will be able to purchase the Solo Bar Plus with wireless Solo Sub for £995, a reduction from the original price of £1300.